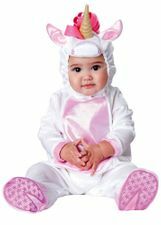 Available Sizes/Colors: Size "Infant One Size (up to 24 months)"
Your little pumpkin will look extra sweet in this infant/toddler jack-o-lantern costume! Includes soft orange plush tunic and soft pumpkin hat with stem. Tights, under shirt, and shoes not included. One size fits most babies up to age 24 months. By Fun World.